China's CAP1400 reactor design has successfully passed the International Atomic Energy Agency's (IAEA's) Generic Reactor Safety Review (GRSR), the Shanghai Nuclear Engineering Research and Design Institute (SNERDI) announced today. The GRSR process reviews the completely- or partially-developed safety cases of new reactor designs that are not yet in the licensing stage. It involves an international team of experts evaluating design safety case claims against selected and applicable IAEA safety standards. The review is not a clearance process but a review of the quality of the safety documents identifying strengths, weaknesses and gaps. SNERDI - a subsidiary of the State Nuclear Power Technology Corporation (SNPTC) - signed an agreement with the IAEA last July for a GRSR review of the CAP1400 design. The company has now announced that the design successfully completed the GRSR review, with the IAEA submitting its final GRSR evaluation report on 27 April. The CAP1400 is an enlarged version of the AP1000 pressurized water reactor developed from the Westinghouse original by SNPTC with consulting input from the Toshiba-owned company. As one of China's 16 strategic projects under its National Science and Technology Development Plan, the CAP1400 is intended to be deployed in large numbers across the country. The reactor design may also be exported. In a statement, SNERDI said: "The successful completion of the IAEA Generic Reactor Safety Review marks further recognition of the CAP1400 by the international authority, laying a solid foundation for the CAP1400 to participate in international competition at a higher level." International use of the CAP1400 is still dependent on meeting country-specific standards and requirements, but passing the IAEA safety review will make this process easier. 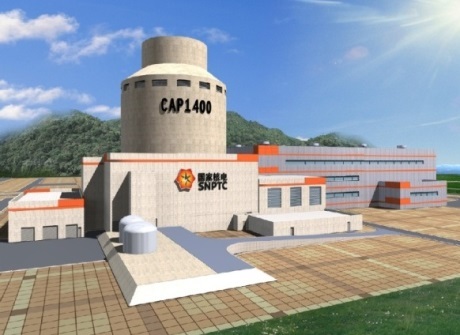 In September 2014, the Chinese nuclear regulator approved the preliminary safety analysis report of the CAP1400 reactor design following a 17-month review. The National Nuclear Safety Administration's safety review involved more than 260 experts, 30 meetings to discuss it and responding to more than 5000 questions, according to SNPTC. As a result of the review, more than 1000 work orders were drawn up. Site preparation is already underway for two demonstration CAP1400 units at Huaneng Group's Shidaowan site in Shandong province. The pouring of first concrete is expected to take place soon.